One of the ideas I had for the month of June, was to write a blog post featuring a player who wore the same number as the day of the month and why they were so special. So today is June 1st and both Jacques Plante and Frank Brimsek wore #1. I will admit that I have heard or read very little about Mr. Zero when it was suggested by my http://www.hobbyinsider.net friends to include him in the blog posts for June 1st. Immediately I went to Wikipedia.org to do some research. Hockeydb.com is also another resource I use quite often. So without further adieu, here we go! During his rookie year in 1938-39 he recorded 10 shout-outs, with a 1.56 GAA. That is pretty incredible given that he played 43 games that year, winning 33 of them. He was batting .760 or in hockey-speak won 76% of his games played. That is insane! If he continued this trend, in an 82 game schedule he would have won 62% of his games. That is mad crazy. I am so glad that it was suggested that I write about Mr. Zero. I would have not have had the wonderful experience of analyzing his stats otherwise. 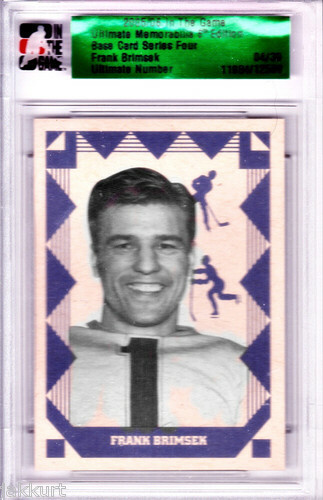 Another notable accomplishment was that he left hockey to fight in the second world war in 1943. I have a soft spot for those who fought in the wars. They helped preserve the democracy we enjoy today. Thank you Mr. Zero for your on ice achievements and for the history lesson. 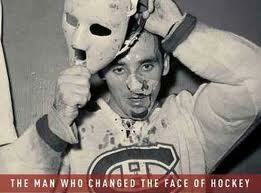 Jacques Plante is considered by many, the founder of wearing a goalie mask full time during game play. The goalie masks of today feature a very sleek aerodyamic design with some very cool artwork. However Jacques didn’t have that luxury. He stood his ground by wearing his famous mask and telling the establishment that he needed to protect his health. I cannot imagine taking a Zdeno Chara slap-shot without a helmet/Mask on. That would take concussions to a whole new level. Jacques, I want to thank you for the inspiration you helped start. The painted goalie mask. Jacques innovations didn’t stop there. Martin Brodeur and Mike Smith are not the first goalies to excel at playing outside of the crease. Mr. Plante did that long before them. He might as well have been the 3rd man on defense. Plante “plante”d the first seed. Now we can reap what he sow-ed! Disclaimer: The images are not mine. I grabbed them from eBay and the google image search engine.